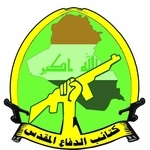 Kata'ib al-Difa' al-Muqaddas ('The Holy Defence Battalions') is a Shi'a militia led by one Abu Assad Allah al-Aboudi. Ideologically, there is identification with Iran's Supreme Leader Ayatollah Khamenei. The group has also put out a photo of its leader in Syria reportedly to defend the Sayyida Zainab shrine.